DEINONYCHUS started to get shape, back in Autumn 1992 as a one-man outfit, created by the Dutch MARCO KEHREN (a.k.a. Odin during the early days), who had came from the Dutch blackmetal band MALEFIC OATH with whom he did one demo called "The Land Where Evil Dwells". The origins of the name are quite incredible: Deinonychus (die-NON-i-cus) is the name of a remarkable and important dinosaur very similar to velociraptor, named for the enormous "killer claw" on its foot... The same word deinonychus comes from two Greek words meaning "terrible claw". 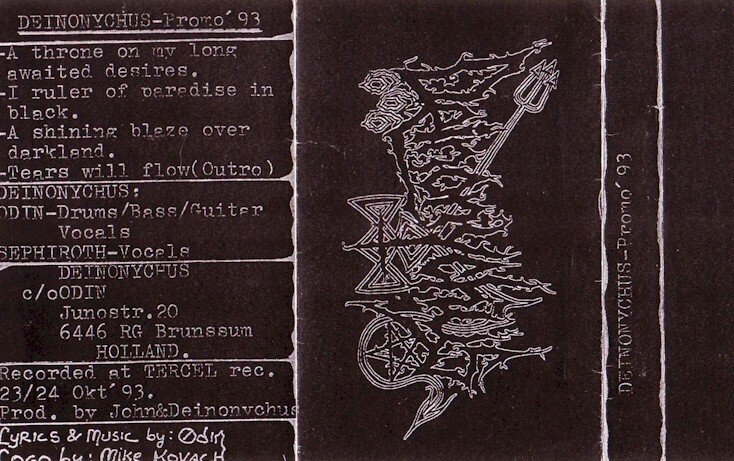 DEINONYCHUS reasoned to exist out of self-explorement, a first demo simply entitled as "Promo 1993" got released in October 1993; five month's before the first and only rehearsal "A Blaze Over Darkland". In March 1994 the band got signed with Cacophonous records from the UK, and recorded their first album "The Silence Of December" in August 1994. Nevertheless, due several delays, the album got released in May 1995. This album showed a progression away from traditional blackmetal, into a mix of black/doom metal with extreme vocals.